I’ve always told visitors to this country (and even some Romanians) that if there is one place to visit in Romania it is Sighisoara and after my recent visit, I am even more emphatic about that. It is truly an amazing and wonderful place. As a kid I used to love stories about dragons and swords and of course castles. And in various other parts of Europe I’ve seen a few quite spectacular castles and medieval fortresses and the like. 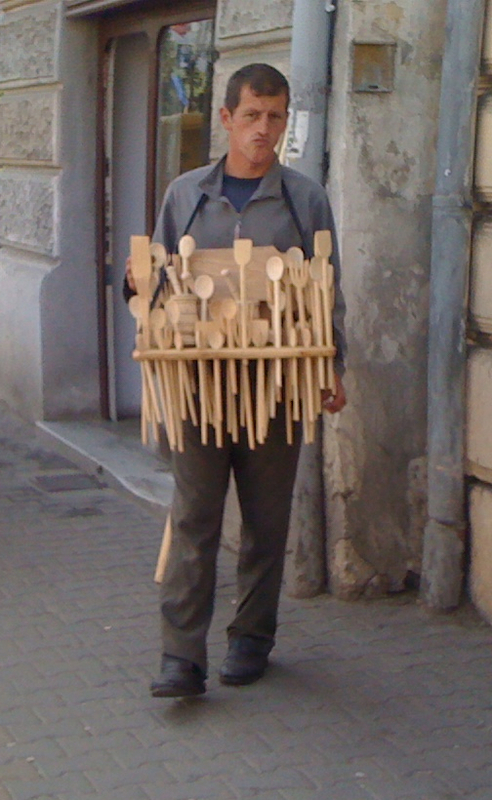 What sets Sighisoara apart is that virtually the entire town is still medieval in aspect and appearance. It’s absolutely amazing – it’s like stepping into a time machine. The ancient houses are not reconstructions or models, they’re the same real buildings from that long gone era, including the childhood home of Vlad Tepes aka the “Real Dracula”. The streets are narrow, winding and paved with cobblestones. Most of the city’s ancient battlements are still in place. Sighisoara is an amazing town to visit all year round but during the medieval festival they take this genuinely ancient city and dress up the inhabitants to match, breathing life into the way things were. It wasn’t just the ladies dressed in costumes of yore (including the flowing gowns) and the sword and shield bearing knights, it was actually a question of a transformation of spirit. I think one of the most moving experiences I had during the festival was a speech given by the local theater company’s director (whose name, sadly, I have forgotten) to the crowd, exhorting them to return to an age of chivalry, moral upright behavior and honesty and respect towards all people. I guess that the way I’m writing this makes it sounds cheesy in the summation but it was more than just an exercise in playing dress-up for him and his outstanding crew. As an American I am used to the “Disney” approach to all things ancient – a sort of prettied-up re-enactment wherein a few historical costumes are donned and all the rest is overpriced snacks and gimmicky souvenirs and piped in music via modern speakers and wires. Certainly there were more than a few touches of the modern world during the festival, including a large central stage with microphones but there were lots of genuine (or as near as could be done) activities going on, ranging from musicians playing medieval melodies on period instruments (including the famous lute), displays of swordcraft and other medieval instruments of war, horse processions and even dance. I guess in far fewer words, there seems to be something truly magical about a medieval festival taking place in an actual medieval city with the “players” all residing there and breathing in that ancient spirit day in and day out versus a few modern folk who take a weekend off to go drive their minivan to a campground and juggle balls to the strains of New Age CDs. Whatever the secret ingredient present that made this festival so memorable, I greatly enjoyed myself and I highly recommend all of you to visit (or re-visit) Sighisoara if you ever get a chance, medieval festival or not. The Bad: Almost everything going on is entirely in Romanian from the signage to the exhibitions, the language the performers were speaking, etc. If you don’t understand Romanian there’s a lot you’re going to miss out on and mostly all you’ll see is people dressed up in costumes and a lot of (admittedly beautiful) handicrafts being sold from stalls. I definitely heard some American English being spoken by some of the visitors as well as a sprinkling of Hungarian and German (note: Sighisoara was largely a German city up until “modern” times so interestingly enough back in the real medieval period that would’ve been the language most people were speaking). Also, the city of Sighisoara’s information office sold us a map for 4 lei (1 euro) even though it was stamped on the front “exemplar gratuit” (free). Nice! The Good: The snacks and water (especially important because Saturday was blistering hot) was a little expensive inside the festival boundaries (essentially the top of the hill where the old city is) but not completely unreasonable. I saw entire trash cans filled to the brim with empty water bottles and I’m glad everyone got properly hydrated enough to stay healthy and avoid tragically unnecessary accidents just for the sake of making a larger profit. There were always between three and five events going on simultaneously so there was always something happening, giving us a wide choice of options. Quite nice. Sometimes the schedules weren’t rigidly adhered to but there was never ever a lack of something to do or see. Despite the fact that the city was jam-packed with tourists, there always seemed to be enough restaurants, bars, pizza joints and the like to handle the volume of people. Unexpectedly Great: I wish I got their name but there was a two-man street theater group from Uruguay who did their act (almost entirely) in Spanish. Absolutely hilarious piece of comedic timing and improvisation and the two definitely earned the multiple rounds of applause and crowd donations. Total Dud: A group of what was quite clearly 100% Americans, from the overfed faces, the wrinkled, oversized and clean but unkempt clothing to the complete lack of Romanian language skills performed an act several times billed as either a “juggling act” or a “medieval drama”. Even the “drama” parts were of such low quality that it was abysmal even by elementary school standards. I think we honestly did a better piece of theater during my 5th grade play. I realize coming up with a “play” to engage people who largely don’t speak your language is hard but the Uruguayan duo did it spectacularly and these sullen-faced American fundies were a discredit even to their own purported mission. Oh and let’s not forget the horrendous “singing”, the kind that infests a lot of “off-brand” American churches today, mostly wailing and going “woah woah” over a 80’s light rock beat with a simple chorus of one short sentence mentioning Jesus repeated several times. I saw a few Romanians back off in horror at the sheer volume of the sound system piping out this “singing”, which was quite amusing to me. There are no airports anywhere nearby except for in Sibiu, which is close but not that close. There are several high-speed trains running to Sighisoara though, especially coming from either Cluj or Bucharest. More information on trains can be found here (Plecari = Departure City, Destinatie = Destination City). There are also a few minibus (minivan) lines running directly to Sighisoara from all large cities either in the south (Bucharest, etc) or from the rest of Transylvania (Brasov, Cluj, Sibiu, etc). The bus will be a little bit faster and cheaper. Inside Sighisoara there are a number of taxi companies with differing rates – most of them run at 1,79 lei/km (roughly $1USD per mile) although we found one company charging only 1,3 lei/km so if you’re pinching your pennies, be sure to scan the rates listed on the front quarter panel of the vehicles before you get in (see my complete Taxi Guide for more information). But wait, what about my part? Ah yes, we cannot forget the most important thing! One of the items listed on the festival’s schedule was called “farse”, literally meaning “farces” in English but a perhaps more accurate translation would’ve been “improv theater”. The amazing director of the Sighisoara theater company selected random people out of the crowd and then set up the basic gist of the story (which was quite medieval and involved a man buying silk for his wife to make a gown) and then had the crowd run wild with the microphone (in character). Quite hilarious. One of the people picked out of the crowd was none other than yours truly. I have to say I wish I had a photograph of the director’s face when he found out I was a foreigner (and American to boot) who was speaking Romanian. I don’t quite think he’s ever had a non-native speaker up on stage before. After all, if you don’t speak Romanian you wouldn’t understand what was going on and so wouldn’t be attending. Quite funny. After the show a few people came up to me and congratulated me and so it all went down very well. I must admit I was a little nervous to be up there, having to both understand a heck of a lot of fast Romanian dialogue AND to participate in it myself but the director handled everything quite smoothly and I really had a lot of fun. So there you go. If you’re ever in Romania, it’s definitely worth it to go visit Sighisoara and especially their medieval festival, held every summer. Unfortunately, at the moment the City of Sighisoara’s website is outdated and clumsily constructed so it can be a little difficult finding out when the festival will be held. On a personal note, I must say The Woman and I stayed in a rather disturbing “pension” (think “bed and breakfast” if you’re American although there was no breakfast). It was in a lovely rural setting just 3km from town and the owner had built a delightful gazebo, a water mill all in a gorgeous little garden setting. Unfortunately, he also had a bizarre fetish for capturing animals. While his cats were free to roam around, one was severely malnourished and the other one clearly had mange. The fish in the little water pond were dying in increasing numbers every day, with a weird bloody aspect around their faces. Whatever was wrong with them, I do not know but even the malnourished cats wouldn’t touch the one dead fish I scooped out and put on the ground. Far more disturbing though was a large wire cage which held both a gigantic hawk of some sort as well as an owl. The two birds constantly were hopping around, agitated and wanting to leave. Another wire cage held a number of ordinary pigeons although they seemed fairly content to be where they were. The only animals I saw in good health in this little one-man zoo were two turtles in a small pond or basin. They eagerly and savagely snapped at anything in their vicinity and seemed to be thriving. The good news (for my heart) was that I got a chance to meet some of the other guests in the place, including a large contingent from Dimbovita and they all told me they had the same idea we did – set those birds free. Pingback: I Heart Sibiu « I'm More Romanian Than You! Hello!….I really loved your articol about the festival and I’m even more happy that you like Romania. I’m actually one of the people who participated with one group of knights (Gladius Dei). 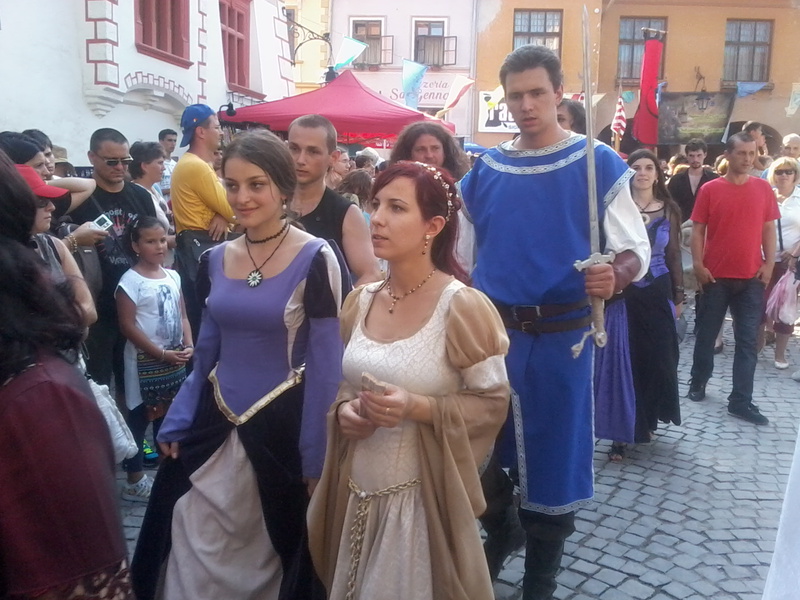 For more information about the other medieval festivals from Romania ( like Brasov,Medias, of course Sighisoara,Bistrita) follow us on Facebook. Have a great day and sorry for my bad english( I’m still learning). Sighi is really a fantastic place. Pingback: Word of the Day: Hal « I'm More Chowmanian Than You!